Construction of an astronomical observatory threatens the integrity of Mount Graham, Ariz., sacred to the San Carlos and White Mountain Apache. This ironic conflict pits the Vatican against Apache spiritual leaders, and astronomers against biologists. “On this mountain is a great life-giving force. You have no knowledge of the place you are about to destroy,” said Franklin Stanley, San Carlos medicine man, in a 1992 declaration. 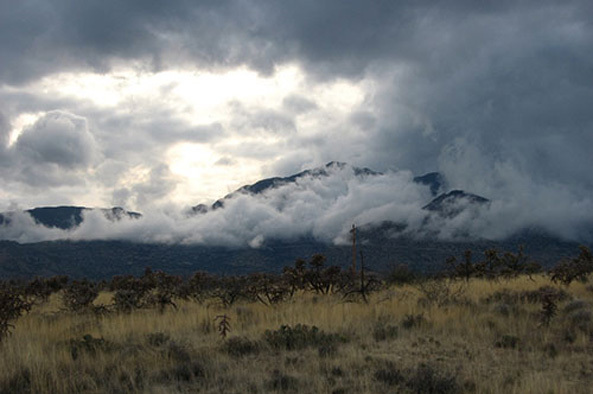 While construction of the project’s first phase has continued, the entire Mount Graham mountain range was declared eligible for listing on the National Register of Historic Places as a “traditional cultural property” in July 2001. In spite of this, 2 telescopes have been built and a third is scheduled for completion in 2004. In the 1980s and 90s, some 30 universities backed out of project and the Max Planck Institute followed in July 2002 due to excessive moisture and cloud cover which inhibit the radio telescopes’ effectiveness. However, Ohio State and Notre Dame have joined the project (selling viewing time at $30,000/night) and now the University of Minnesota and the University of Virginia are considering investing in the project. The University of Arizona built an underground 25,000-volt power line, electrifying the sacred mountain to the great distress of the Apache. Since the power line was not included in the first phase of the project, opponents of the project challenged UA in court on the grounds that the power line and all future construction should be subject to the NEPA, ESA, and NHPA. In May 2001, a federal court judge ruled that the Arizona-Idaho Conservation Act remains in effect, exempting UA from compliance with these laws. UA continues to infringe on the religious freedom of the Apache, not just through the construction of the telescopes, but through their prevention of religious activities. In 1997, an Apache man was arrested for trespassing on the site while trying to pray. UA responded by establishing a rule by which the Apache must request permission in writing 48 hours prior to entry and reveal prayer locations and times in order to obtain a permit to pray on the mountain. All ongoing and future construction projects by the UA must be held to the standards of NEPA, NHPA, and President Clinton’s Executive Order 13007. If the spirit of these laws is enforced, it is hard to see how any more telescopes will be allowed on top of Mount Graham. Furthermore, the current telescopes and facilities should be taken down and the sanctity of Mount Graham preserved for traditional religious practitioners. The first two telescopes are small, inexpensive ($3-8 million each) and easily removable. The third is an empty building with the movable metal parts waiting in Italy and the mirrors incomplete in a UA production facility in Tucson. That telescope should be relocated to a non-destructive and more astronomically suitable site. The entire mountain and the watersheds that emanate from it should be listed as the traditional cultural property of the Apache. Write to the following universities to urge them not to participate in the UA telescope project. Native American nations and tribal governments could consider a resolution opposing the UA projects—see the NCAI resolution below. “Mount Graham threatens science without humanity.” Minnesota Daily, October 1, 2002.